Shelley Bean: Last Day for Sale-a-Bration!! And my last Waterfront Post! Last Day for Sale-a-Bration!! And my last Waterfront Post! 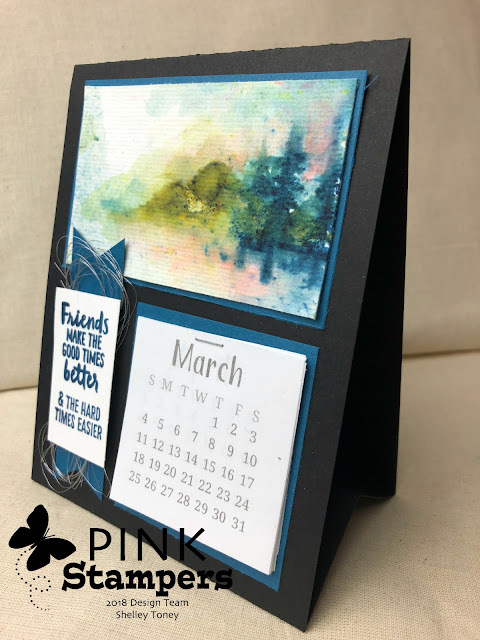 Finally, I wanted to share the last project I made with this very versatile stamp set, Waterfront. Love it! But before I get into that....I wanted to remind everyone that the clock is ticking away on this the very last day of 2018 Sale-a-bration for Stampin' Up! So many wonderful perks are still available...free stamp sets and items are there for the taking. Don't miss out!!! Read to the bottom for all the details!! I knew that I wanted to make something that wasn’t a card and wasn’t a scrapbook layout, but my mind went blank when it came to something 3-D with this stamp set. It seemed like something that needs to be more like artwork, but couldn’t envision that on a treat box, etc. So, I opted for something semi-permanent, or at least something that wouldn’t be discarded after 1 use. A desk calendar seemed like a good option. With the year already 3 months in, I hesitated, but, decided, why not? Here is how I created my calendar! Simply create a basic A2 Card. Then, to make the stand, cut another piece of Cardstock at 4.24” x 5”, scoring at 1”, 2.5” and 4” all along the 5” side. Simply attach the 1" flaps to the Inside of the card base, and you have the easel. This was another use of the Brusho Crystal Colors. Once again I liberally sprinkled the Brusho directly onto my mountain stamp and this time I really applied the water liberally on my paper. I laid the paper directly down onto the mountain stamp instead of the stamp onto the paper. (This kept more control over the crystals so they wouldn’t fly everywhere and bleed in the water) I smoothed the paper over the top and pulled it away. It made this lovely blurry image that I moved around a little bit with my Aqua Painter. I blotted a little with tissue as needed so the image didn’t get too our of control. I did the same application with the trees, being careful to keep them straight and where I wanted them. I knew simplicity would be important and just let the Brusho do it’s think by guiding it around with my aqua painter. I actually picked up residual crystals off of the stamp with my aqua painter and made my sky and added the nice blurry ambient surroundings. It reminded me of the misty, wet mountains of my childhood on the Oregon coast. If you haven’t played with Brusho yet, I recommend you do! I am so in love with this product….and have my fingers crossed tightly they will carry it over in our new catalog this year. Tiny sprinkle of Camboge for the pinky look in the sky. You're making some gorgeous creation with the Waterfront set! Love this!